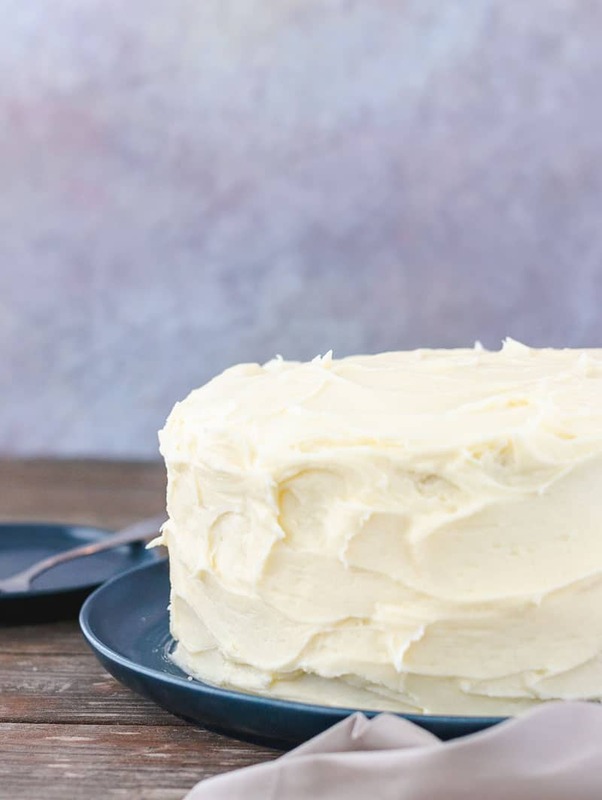 You’ll want to make this moist french vanilla cake from scratch every day. 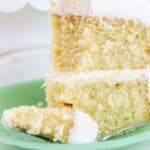 Add this fluffy cake to your best cake recipe list because it’s sure to be a favorite. 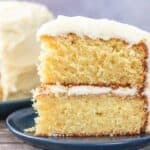 This french vanilla cake is super moist and it’s jam packed with french vanilla flavor, then covered in rich french vanilla buttercream. Back then, I made cakes from a box. It was easier for me and frankly I was impatient and just wanted to eat my cake as soon as I could. I was very fond of the French Vanilla cake mixes. Nine times out of ten, I’d choose that flavor to bake. 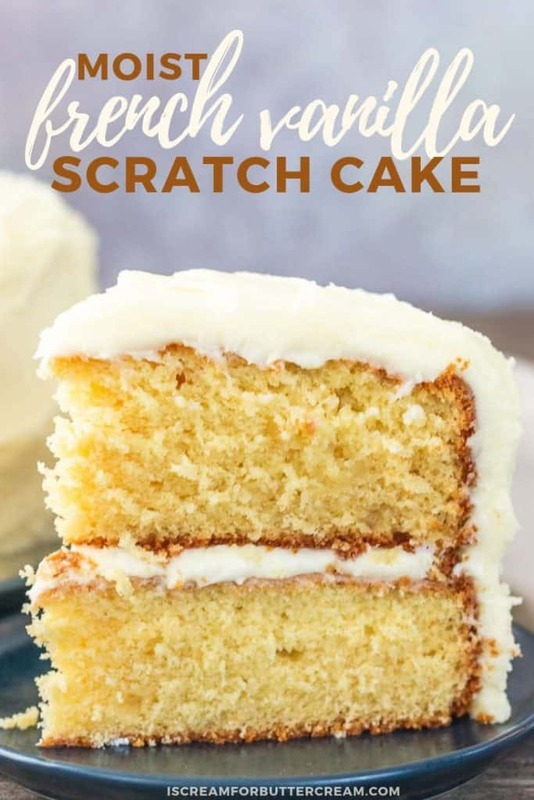 So, for this recipe, I really wanted to create a scratch version of that cake. So why ‘french’ vanilla and what’s the difference? Well I really didn’t know. All I knew was that I really liked the flavor. So I did what I do best and decided to do a little research. I’ll spare you all the details and just go with a summary here if you’re interested. So generally, types of vanilla are named after the places where they’re grown…Madagascar vanilla, Tahitian vanilla etc., but apparently that’s not the case with French vanilla. French vanilla is actually a way of making a custard that gives it a rich, deeper taste. So, yes, it’s a flavor, but not in the same way as the other vanilla extracts. You get that flavor because of a method that is used to make the custard. Well okay…I’m not gonna argue with science or history, but I’m just sayin’ that I can tell the difference. It’s subtle, but I knew what I was looking for and I knew there had to be a way to get it. You can make this recipe without it, but I think it’s SO good if you can get it. I also used french vanilla creamer and a french vanilla pudding mix and that gives it a little extra french vanilla flavor, but doesn’t make it taste fake. We’re covering this bad boy with french vanilla buttercream. We’re not skimping on the french vanilla…nope…might as well go for the gold, right? 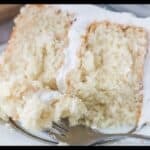 The mixing method for this cake is the old fashioned creaming method. Nothing out of the ordinary here. This recipe calls for french vanilla creamer. Use the liquid creamer you get in the dairy aisle at the grocery store. If you can’t get this, just use half and half cream. 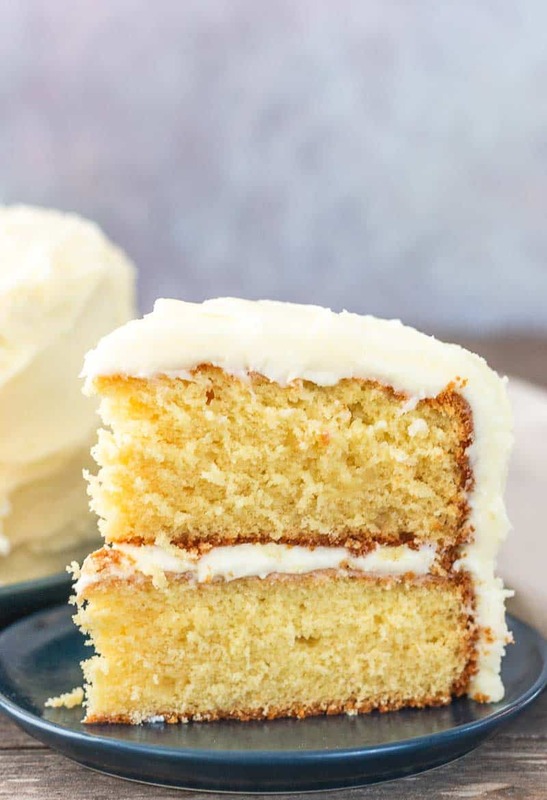 This recipes calls for a specific type of vanilla extract for this cake. You can find it here: French Vanilla Extract It is very good, but if you can’t get it, just use regular vanilla extract in the same amounts. It won’t have that french vanilla taste, but it will still be good. Try to get the eggs as close to room temp as you can. Just set them out a bit before you start baking. Ok, let’s get to the recipe. Don’t forget, there’s a video there as well to help. 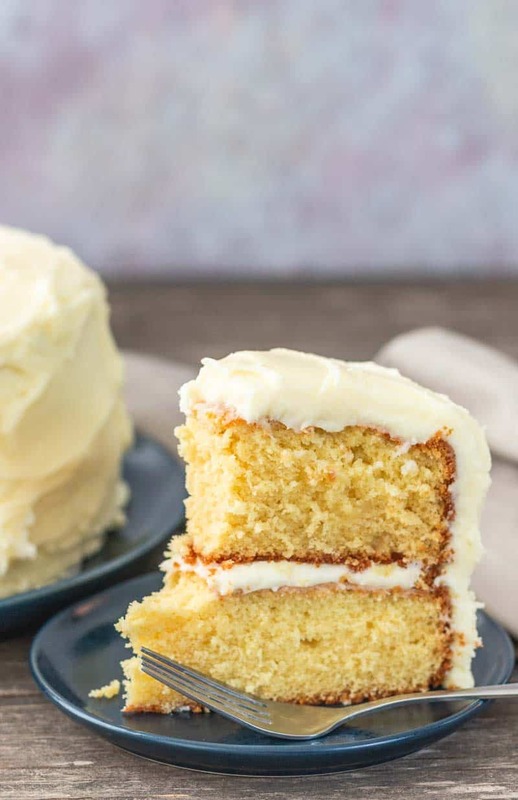 This french vanilla cake is super moist and it's jam packed with french vanilla flavor, then covered in rich french vanilla buttercream. Grease and flour two 8" round cake pans and set aside. In a bowl, combine the flour, baking powder, salt and small package of dry instant french vanilla pudding. Whisk well and set aside. In another bowl, add the french vanilla coffee creamer, milk, oil and french vanilla (or regular vanilla) extract. Whisk well and set aside. In a large mixing bowl, add the room temperature butter and mix on medium until smooth. Add in the sugar and mix on medium and then on medium high for several minutes until light and fluffy. Add in the eggs one at a time and mix on medium just until combined. Only mix until the egg is just incorporated. Try not to over mix. If your eggs are super cold, your batter may look a little curdled at this point, but just keep going. Scrape down the sides of the bowl and mix again on medium, just until everything is incorporated. Scrape down the sides of the bowl and mix again until well combined. You only want to mix until well combined, which is about 15 seconds. Mixing for several minutes is too long for a scratch cake. Divide batter into the prepared pans. Batter will be quite thick so just spread it around evenly in your pans. Bake at 325 degrees for approximately 55 - 60 minutes. The cake will be a little darker than the normal golden brown. Insert a toothpick somewhere in the middle and a few moist crumbs should stick to the toothpick. Remove from the oven and cool in the pan on a wire rack for about 20 minutes, then turn out onto a rack and cool completely before adding buttercream. In a small bowl, add the milk and the two tablespoons of dry french vanilla pudding mix. Whisk well and set aside. In a large mixing bowl, cream the butter well for a minute or two on medium/low to medium speed. Add in three cups of confectioner’s sugar and the salt and mix on low until incorporated and then medium until well mixed. Add one tablespoon of french vanilla creamer and mix on low, then medium until incorporated. Add the last four cups of confectioner’s sugar and mix on low until incorporated and then medium until well mixed. Add in the milk and pudding mixture plus the vanilla extract and mix on low until incorporated, then on medium until well mixed. Check the consistency. If it’s too thick, add another tablespoon of the french vanilla coffee creamer and mix again. You may need to add more cream, or milk to get the correct spreading consistency. Once you reach the consistency desired, beat on medium speed for a couple minutes until fluffy, then spread onto cake. This cake can be stored in the fridge for approximately 5-6 days. Make sure to read the tips & faq section in the blog post for frequently asked questions about this recipe. 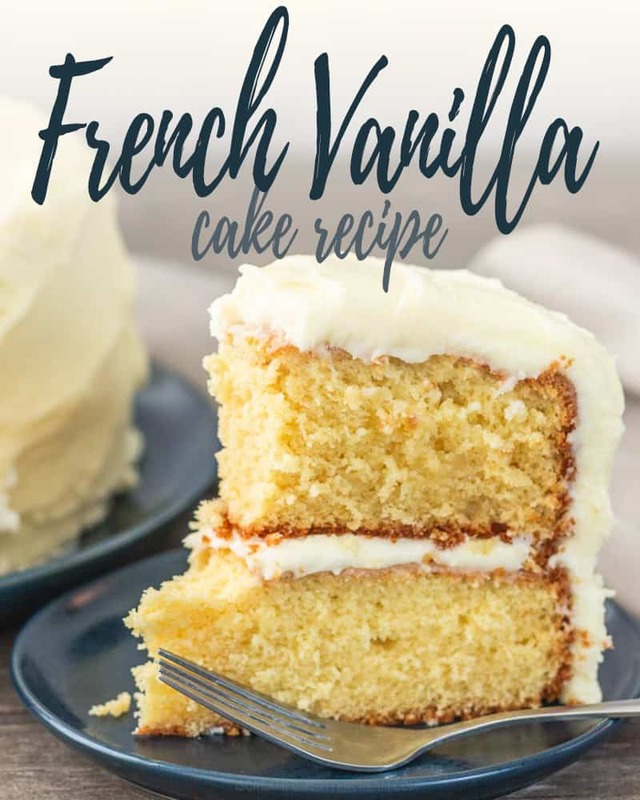 GET THE FREE DESIGNED RECIPE CARDS FOR THE FRENCH VANILLA CAKE & BUTTERCREAM PLUS THE PASSWORD TO THE RESOURCE LIBRARY. Just fill out the form below! WANT TO SAVE THIS? 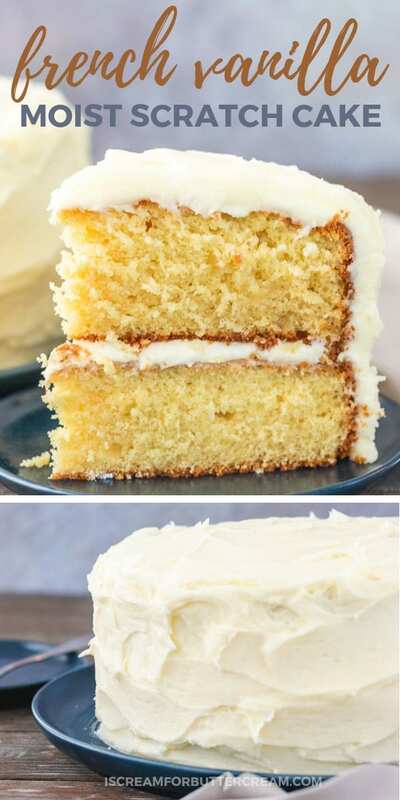 CLICK HERE OR ON THE PIN IMAGE BELOW TO SAVE THIS POST TO YOUR FAVORITE CAKE RECIPE PINTEREST BOARD. « Should I Refrigerate My Cake Before Decorating?